Facts about Australian Shepherd Dogs, "Scientific name for Australian Shepherd Dog, or domestic canine, is Canis lupus familiaris". The Australian Shepherd Dog is a breed of herding dog that was developed on ranches in the western United States. Despite its name commonly known as an "Aussie", the breed did not originate in Australia. The Australian Shepherd Dog was given its name because of their association with the Basque sheepherders who came to the United States from Australia in the 1800's. The Australian Shepherd Dog are an intelligent, medium-sized dog of strong herding and guardian instincts. The Australian Shepherd Dogs are also delightful and loyal companions and great family dogs. The Australian Shepherd Dog love to be part of the daily hustle and bustle, and enjoy riding in the vehicle just to be with their beloved master. As farm dogs, they diligently carry out their responsibilities, be it bringing in the stock or finding the stray one that got tangled in the brush. The Australian Shepherd Dog are easily trained, easily housebroken, because they are intelligent and eager to please. The average weight is 40 to 65 pounds (18.1 to 29.4 kg). Australian Shepherd Dogs are very active dogs that need a great deal of exercise on a daily basis to prevent them from becoming bored or frustrated and consequently developing destructive habits. Because of the Australian Shepherd Dog high energy level, combined with high intelligence, Australian Shepherd Dog need to be given a job to perform, be it shepherding the children, protecting the house, herding livestock or competing in dog events. One of the most frequent reasons Australian Shepherd Dog get turned over to dog rescue groups is that their owners didn't anticipate how energetic the Australian Shepherd Dogs are and weren't willing or able to constructively channel that energy through training. Australian Shepherd Dog want to be with their owners all the time, which is why they insist on following their owners from room to room in the house, and love nothing better than going along in the car or truck on errands. 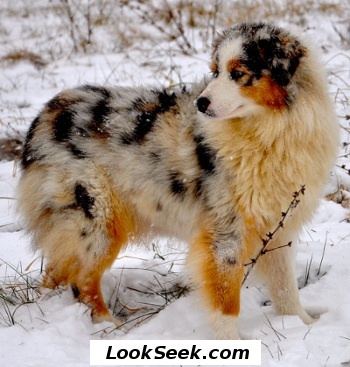 The Australian Shepherd Dog comes in four acceptable colors, Black, Blue Merle - a marbling of gray/silver and black, Red - ranging from light cinnamon to liver, Red Merle - a marbling of red and silver or buff, A variety of white and tan markings may appear on the face, chest, front and rear legs. The Australian Shepherd Dog is an intelligent working dog of strong herding and guarding instincts. He is a loyal companion and has the stamina to work all day. The Australian Shepherd Dog is well balanced, slightly longer than tall, of medium size and bone, with coloring that offers variety and individuality. The Australian Shepherd Dog is attentive and animated, lithe and agile, solid and muscular without cloddiness. The Australian Shepherd Dog is an intelligent, active dog with an even disposition; Australian Shepherd Dog is good nature, seldom quarrelsome. Though somewhat shy around strangers, they are good nature and delightful companions. Because of their love for play, the Australian Shepherd Dog makes a great family dogs, always wanting to be in the midst of their family. Australian Shepherd Dogs have two times the amount of ear muscles than people. A Australian Shepherd Dogs can hear a sound at four times the distance of a human. Sound frequency is measured in Hertz (Hz) Def-Hertz is the measurement of frequency, explicitly it's one cycle per second. The higher the Hertz are, the higher the pitched the sound is. Australian Shepherd Dogs hear best at 45,000 Hz to 65,000 Hz, while humans hear best at around 20 Hz to 20,000 Hz. The Australian Shepherd is a double coated breed. The overcoat varies from straight to wavy to curly, and is of medium length and texture; it is also weather proof. Like all other double coated breeds, the undercoat is soft and dense. Most Australian Shepherd Dogs will blow their coat once a year in the early summer months, though some may blow twice a year. It is found that Australian Shepherd Dogs kept inside shed all year long. Australian Shepherd Dogs sweat glands are between their paw pads. One of the most common reasons Australian Shepherd Dogs are brought to dog rescue shelters, is because their owners had no idea on how much energy they have and were not willing to help channel that energy through exercise. If you are thinking about getting an Australian Shepherd Dog keep in mind that it will require a lot of exercise or they can become frustrated and sometimes even become aggressive because of all the bottled up energy. When purchasing a Australian Shepherd Dog from a breeder, make sure to find a good breeder with references, check at least two to three of the puppies that were purchased from this breeder. Only humans and dogs have prostates, But a dog doesn't have an appendix. Australian Shepherd Dog’s nose prints can be used to identify them, their nose prints are like a humans finger print. A Australian Shepherd Dog smells more than 1,000 times stronger than that of a human. A Australian Shepherd Dog’s nose, secretes a thin layer of mucous that helps it absorb scent, after that they lick their noses and sample the scent through their mouth. A Australian Shepherd Dog is an omnivore, (definition-they eat both other animals and plants). All Dogs are direct descendants of wolves. The number one heath problems amongst Australian Shepherd Dogs is obesity, so always make sure your dog doesn't get to fat. Many foot problems that Australian Shepherd Dogs have are just an issue of long toenails. Australian Shepherd Dogs pant to keep cool with 10 to 35 breaths per minute with an average of 24 breaths per minute. A large dog breed resting heart beats between 60 to 100 times per minute, and a small dog breed’s heart beats on average between 100 to 140 pant a lot. A Australian Shepherd Dog’s mouth can apply approximately 150 to 200 pounds of pressure per square inch and an American Pit Bull Terrier, German Shepherd Dog and a rottweiler can have 320 LBS of pressure on avg.